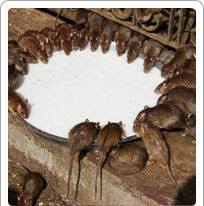 Deshnok temple or the Karni Mata temple of Bikaner is also famous as the Rat Temple. It is situated in the Deshnok village nearly 32 kilometres from Bikaner, about 40 minutes drive. The place has an interesting history as well as some myths associated with it. Formed by taking the corner plots of ten villages, it was called Dus-Noke (ten corners) and gradually became Deshnok. The patron Goddess worshiped at the Karni Mata temple was a 15th century mystic who is considered a reincarnation of Goddess Durga. Karni Mata is believed to have performed various miracles. The temple is not meant for people of a squeamish temperament. The temple is run over by numerous brown rats. The story goes that these rodents are reincarnations of the members of Karni Mata's family. There are nearly 600 families here who claim to have descended from Karni Mata and believe that their relatives are reincarnated in the rodent form. These rats are well fed and they do not bother people. Sighting a white rodent is considered auspicious. The temple has silver doors. The Karni Mata temple is an important pilgrimage destination and is visited by a large number of people seeking boons from the Goddess. The temple and the town are also the location of the Karni Mata fair. The temple is open from 4 am to 10 pm daily.